Picture shows a prototype. On the final model, the text "Morph Settings" will be replaced by "Trigger 3/4". "Morph Settings" will be a touch button. -July 2018. Pre-ordering are open now. -Comes loaded with a bunch of original Gotharman drum samplings and presets. -4 Parts. 2 Synth parts and 2 sampler parts. 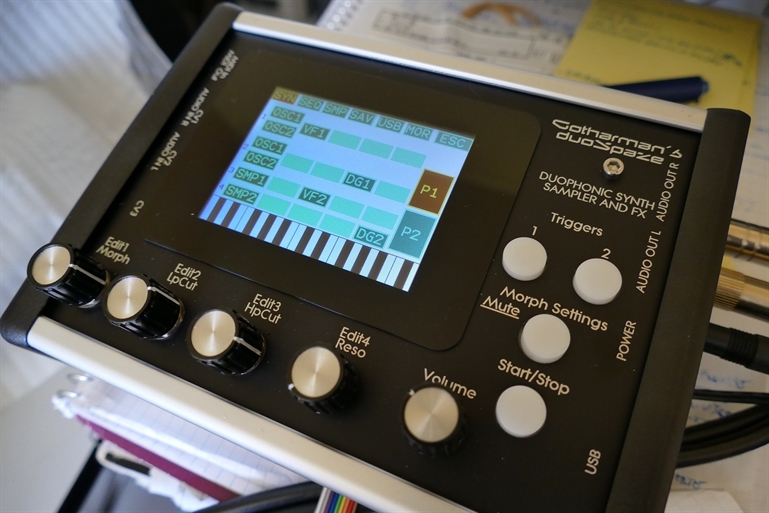 The Synth parts supports duophonic playback, and polyphonic playback via poly-chaining. -4 oscillators arranged in 2 Synth parts with 2 oscillators each. For each synth part: Osc1: Morphable waveforms, FM to Osc2, PWM. Osc2: Sine, tri, saw, pulse and noise. Sync to Osc1, PWM. -2 samplers arranged in 2 parts, with one sampler each. Start point can be adjusted and modulated, end point can be adjusted, Chop can be selected and modulated (up to 64 chops per sampling), and FM can be applied from the Osc2's of the Synth Parts. FM amount can also be modulated. -2 Ring Modulators between Osc1 and Osc2 in the Synth Parts. -4 Analog Filters arranged as 2x HPF+LPF. Can be inserted to any part in the Audio Matrix. Has G-Ray circuit. Cutoff can be adjusted and modulated, Resonance can be adjusted and modulated, FM (to Osc2) can be adjusted and modulated, G-Ray feedback can be adjusted and modulated. -2 Digital Filters that can be inserted to any part in the Audio Matrix. Cutoff and Resonance can be adjusted and modulated, input and output levels can be adjusted, and filter type (16 types) can be set. When 2 different filter types has been selected for Morph Layer A and B, duoSpaze will morph between the filtertypes, when the Morph knob is turned. -6 Effects Processors. 4 Insert Effects, that can be inserted to any parts in the Audio Matrix, and 2 Output Effects, that each of the 4 parts can be sent to. Granular effects, reverb, delays, pitch shifters, glitch shifters, pitch shaper, chorus, FAT, distortion, bit crusher, filters, resonator, and more Gotharman specials. -4 VCA's. One for each of the 4 parts. -8 ADSR envelopes. 2 for each of the 4 parts. -4 Decay envelopes. 1 for each og the 4 parts. -4 LFO's with morphable waveforms and keysync. Can freely be assigned to any parts. -4 Random generators. Can freely be assigned to any parts, and trigged by any parts and the LFO's. -Audio Matrix. Let's you assign filters and effects to each part in realtime, by a touch interface. -Play modes: Multi-timbral, duophonic (synth parts only -samplers stays multi-timbral), stereo samplings playback. -Morphing between 2 layers of sounds. This powerful system lets you program 2 layers of sounds and sequences for each preset, and morph smoothly between these. -Copy function. Parts and sequencer tracks can be copied between presets, and inside presets. -MIDI in and out. Polyphonic aftertouch are supported. -USB for import/export of wav files and presets/songs, importing of PolySpaze presets, and for updating the firmware. -22 minutes of sampling time / 255 samplings held in NOR FLASH memory. Kept in memory, even when switching off. 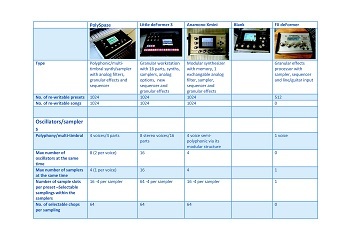 Each sampling can hold up to 64 "sub" samplings as chops, when the "Import Samplings As Chops" function is used, so the total maximum number of samplings is 16.320 (255x64). -Audio In L and R, 2x 1/4 inch mono jack. -Audio Out L and R/headphones, 2x 1/4 inch mono jack. -3 x CV/trigger Inputs (optional). Accepts up to +/- 15 volts. Internally scalable to work in +/- 12 volts, 0-12 volts, +/- 5 volts or 0-5 volt ranges. Minijacks. Intput sample rate: 5 KHz.